The research found that eastern U.S. summer daily high temperatures that currently average in the low-to-mid-80s (degrees Fahrenheit) will most likely soar into the low-to-mid-90s during typical summers by the 2080s. In extreme seasons — when precipitation falls infrequently — July and August daily high temperatures could average between 100 and 110 degrees Fahrenheit in cities such as Chicago, Washington, and Atlanta. The global model simulated rainfall too frequently, so that its surface temperatures were not appropriately sensitive to interannual changes in Pacific sea surface temperatures. "Since the weather prediction model simulated the frequency and timing of summer precipitation more reliably than the global model, its daily high temperature predictions for the future are also believed to be more accurate," added co-author Leonard Druyan, NASA Goddard Institute for Space Studies and Columbia University. 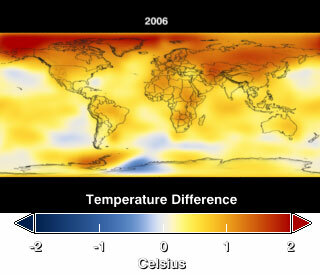 The study is published in the April 2007 issue of the American Meteorological Society's Journal of Climate . Lynn, B.H., R. Healy, and L.M. Druyan (2007), An analysis of the potential for extreme temperature change based on observations and model simulations, J. Climate , 20, 1539-1554, doi:10.1175/JCLI4219.1. This article was originally prepared by Mike Bettwy as a NASA Portal Looking at Earth feature.